Go to the CommunityUse link provided by your district or school. Bookmark this page or create a shortcut on your desktop to make it easy to come back to this page later. At the top of the page, click on the Login to Request Facility Use link. If you have already registered, enter your login name and password into the fields and click Log In. Once you are logged in, the system will default you to the Home page where you can view the calendar. You can filter the calendar at the top of the page, by Organization, Location, and Organization Type. Additionally, you can search for a particular event Description. Click the Filter button to apply these filters to the calendar. Once filtered, the facility events will show on the Month view calendar by default. You can change the calendar view to show Week, Day, or Event List. 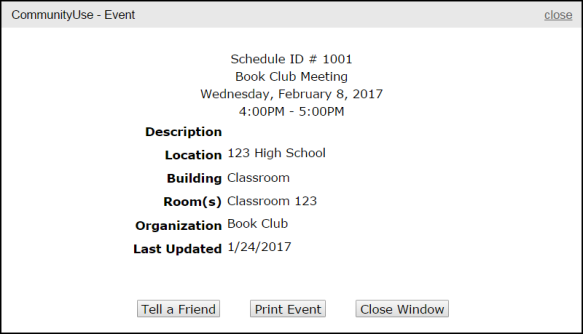 In order to see event details, click on the event title. This is where you will go to submit your facility requests. This page will list your previously submitted requests as well as allow you to View Invoices. If your account is setup to take online payments, you will see a View Invoices & Pay Online link that will allow you to make invoice payments online. You can filter requests by the same filters you see on the calendar, or sort them by any of the fields at the top of the list, such as Schedule ID, Status, or Location, by clicking on the gray square next to the sort name. *Note: If the schedule is still in the Submitted status, you will be able to access and edit the request by clicking on the Title. If the request is no longer in the Submitted status, you will need to contact the District or School to make changes. On the My Organizations tab you can review the Organization(s) that you have been approved to submit requests for. Clicking the Organization Name will take you to the Organization Information page where you can verify the Address and other important information including Insurance Information. Please contact your CommunityUse Administrator if any of the information is inaccurate or out of date. If you need to request events for another organization click on the Request Another Organization link to submit a request to be added to that organization. The My Settings page is where you can update your personal contact information, reset your password, or turn your email notifications on or off. Be sure to click Submit to save any changes. On the Documents tab, you can download any documents that Administrators have posted for community users to view. The Help page is where you will find any provided district or school contact information. Use this information if you have questions about your facility request.